"I've always thought that it was patently obvious that the Fed caused the Great Recession with a tight money policy that allowed NGDP expectations to collapse in late 2008." Obviously, Sumner knows that, unlike the ECB, the Fed didn't raise interest rates prior to the Great Recession, but he thinks there was "passive tightening" where the Fed failed to lower interest rates in response to the macroeconomic shock, and in that sense caused the recession that followed. "But other people apparently don't see it as being at all obvious. They look for alternative explanations. And yet when you ask them why, they tend to give these really lame 'concrete steppes' explanations, such as, 'The Fed didn't raise interest rates on the eve of the Great Recession, so how can you claim that tight money caused the recession?' Or they show themselves to be completely ignorant of actual Fed policy, and claim that the fed funds target was at zero when NGDP expectations collapsed in 2008. It wasn't." The Fed funds rate did trail NGDP by a few months—it doesn't start to fall until a bit after NGDP starts to fall, and doesn't trough until a bit after NGDP troughs. But there's still something a bit weird about this claim. Sumner's argument boils down to this: if only the Fed had lowered the Fed Funds rate a few months earlier, the whole recession would not have happened. But lowering the Fed Funds a few months late fails to produce a similar effect. "But as for the rest, the overwhelming majority who think nominal shocks do matter, I’m mystified. Take the AS/AD model that you see in McConnell, Mankiw, Krugman, Cowen and Tabarrok, Hubbard, or any of the other textbooks. Why do we even teach this model if confronted with an almost perfect example of a depression caused by tight money, we simply don’t believe it?" Problem is, that's not what those models say. Those models predict a symmetrical positive effect on NGDP when monetary policy is loosened, like we saw in the early 1980s with the Volcker experiment. But there was no sharp upswing in 2008 as the Fed floored interest rates. Hence, there's definitely something weird here that conventional theory doesn't explain. If the Fed dropped the ball, why did the ball shatter instead of bounce? Everything before the ? 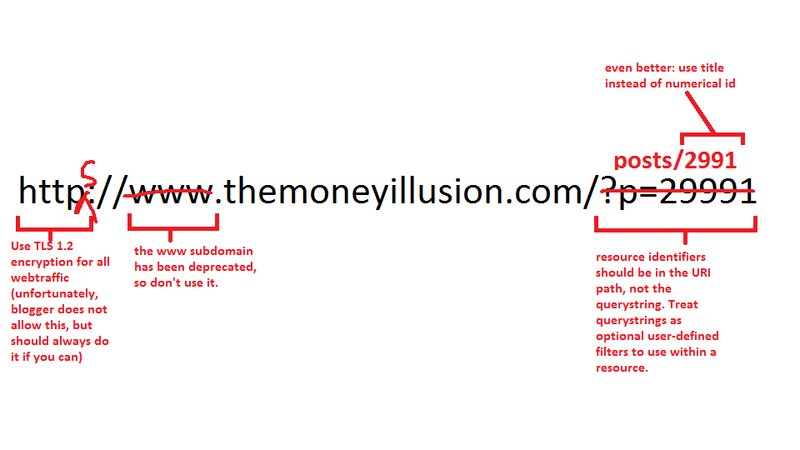 in the URL is the URI path, which identifies a resource—in this case the blog post—within a hierarchical interface, while everything after is called the "querystring." A handy way to think about it, I think, is that the path should be required information to get to the resource, while querystrings should contain only optional, user-defined information relevant within the requested resource. For example, https://myshop.com/products/42 should give us product number 42 from shop.com, but if we want to supply a search term to filter products by, we might use https://myshop.com/products?search=market+monetarism which filters the products resource on our search term "market monetarism" that we provided. "Sumner's argument boils down to this: if only the Fed had lowered the Fed Funds rate a few months earlier, the whole recession would not have happened. But lowering the Fed Funds a few months late fails to produce a similar effect." Well, in those few months a financial crisis happened. So it's not really strange if equilibrium interest rates changed. They change even in a calm economy. So, by lowering interest rates in a timely manner, the Fed could have counteracted the rampant theft and recklessness being perpetrated by the banks and Wall Street? Fascinating.